Among the regression techniques used in building statistical downscaling models, genetic programming (GP) which mimics Darwin’s theory of biological evolution possesses several pros such as it evolves explicit linear or non-linear relationships while identifying optimum predictors, and it discards irrelevant and redundant information in predictors. However, GP is known to simulate unphysically large outliers of predictands. In statistical downscaling, decomposition of predictand and predictor data into number of different time-frequency components with wavelet transform and modelling each component separately should better simulate the time-frequency properties of the predictand, in theory. Therefore, it is important to investigate pros and cons of using GP with wavelet transform in building downscaling models. 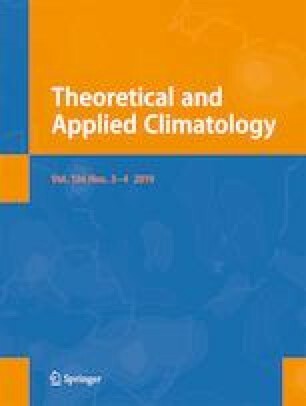 In this study, wavelet and non-wavelet-based precipitation downscaling models were developed employing GP and generalised liner models (GLM) for 50 stations located in wet and dry climate, with 20CR and NCEP/NCAR reanalysis data, for the investigation of the above matter. It was found that regardless of the mother wavelet, vanishing moment and climate regime, with the increase in decomposition level, the wavelet-based downscaling models developed with GLM tended to show a distinct deterioration in performance in both calibration and validation unlike the wavelet-based downscaling models developed with GP. This was because GP is able to discard unnecessary/redundant information flowing into the model with the increase in the decomposition level through evolution. Furthermore, it was found that when GP is coupled with wavelet transform, the simulation of unphysically large values of the predictand increases significantly. The online version of this article ( https://doi.org/10.1007/s00704-019-02848-2) contains supplementary material, which is available to authorized users.